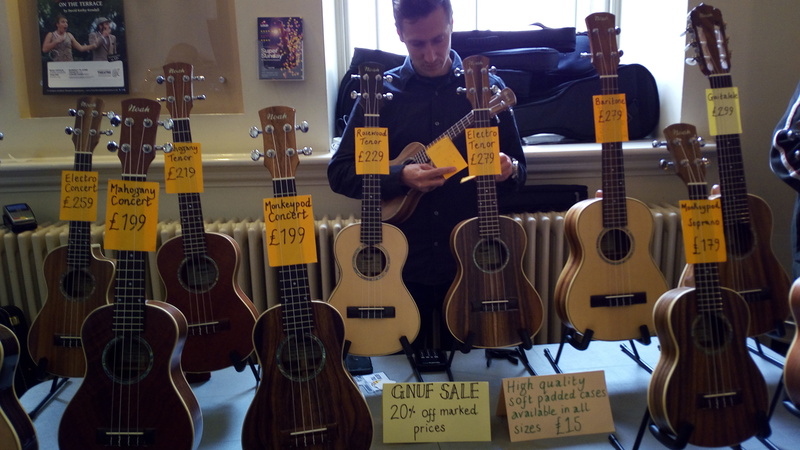 Here’s my report from the Grand Northern Ukulele Festival 2017. I hope this serves as a guide for those who may have wanted to go in the past but were unsure. I hadn’t planned to go to GNUF 2017. Like all those uke lovers who haven’t been, I didn’t know if it was worth the £46 for the whole weekend. Having been to Glastonbury and a few other camping festivals, I know there is lots to do and see and you are willing to pay quite a bit. Is GNUF worth £46? One of the volunteers at this year’s GNUF contacted me and offered a complimentary ticket. Did you read “volunteer”? Yes!. They don’t get paid to put on this amazing weekend. 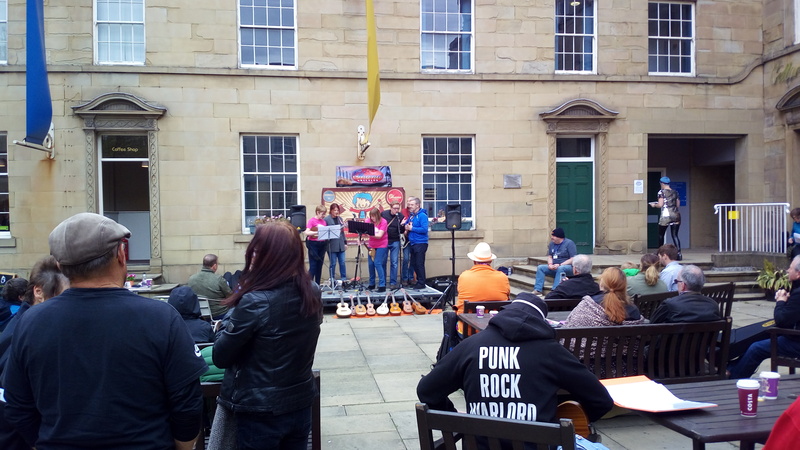 They work with the community, with disadvantaged communities and give up their time to support the ukulele and the local communities in and around Huddersfield). 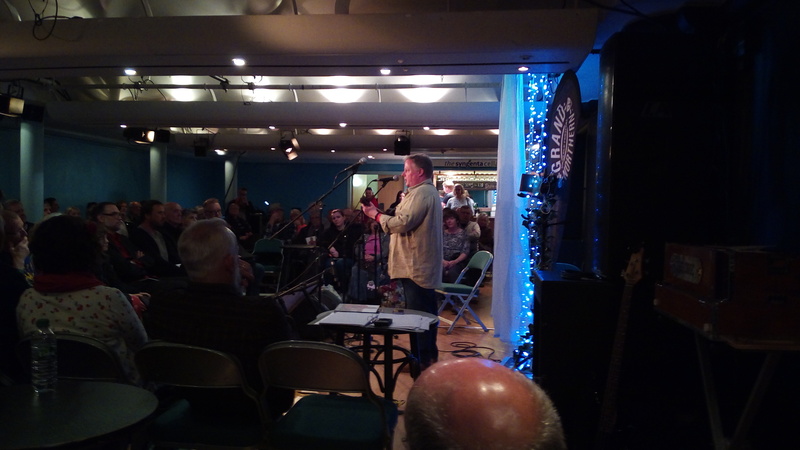 I have been to many open mic nights, bands or ukulele based days where people go up on stage and “do a turn”. After you’ve heard “Wonderwall”, “Bad Moon Rising” or “I Wanna Be Like You” the third time, you start to feel a little tired. The GNUF had a stage for people to “get up and do a turn”. This is true. But they were polished and they produced a good sound. There were good singers and chose a great selection of songs to perform. I believe “Mim”, the organiser, had put effort into choosing the right groups. BUT THERE IS SO MUCH MORE! At GNUF there were more than one stage. I counted 4 stages, but they host different events on each stage. One is an intimate performance area during the day, Cabaret at night. 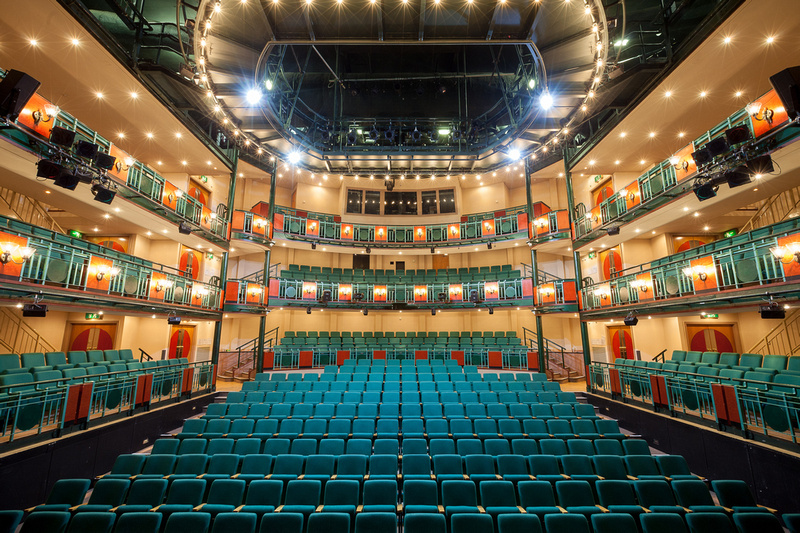 There is a Main stage – which is a large theatre with stalls, side seat and two balconies. This is the type of place you’d see a pantomime or opera. Downstairs there is The Cellar, where intimate performances are held. You can hear every breath and, (if you are lucky), you can sit 2 feet from the artist and converse with them. Outside there is an open air stage with amplification and seating. This is where I ate my lunch and listened to group – after singer – after group sing their hearts out. The ideal place for a pint and a sandwich. Did I mention a pint? The cellar has a bar and there is a bar upstairs. In each corner there are small gatherings strumming out their latest efforts. There were some really good singers in there and a whole band complete with tea chest bass. As I couldn’t be there long (only Saturday of the three day event) I will take you through what I saw in order. I arrived late – around 1pm, having found the venue quickly in the van, parking and then getting lost on foot. I parked about half a mile away and my sat nav told me that the venue was 7 miles away in a different Queen street. On first arrival I walked into the open air performance square where “Mim’s Stage” was encouraging groups and singers to stand up give their all. I was very impressed with the standard. Keen to explore, I wandered into the front of the Lawrence Bately Theatre. I was impressed. This is a wonderful venue. 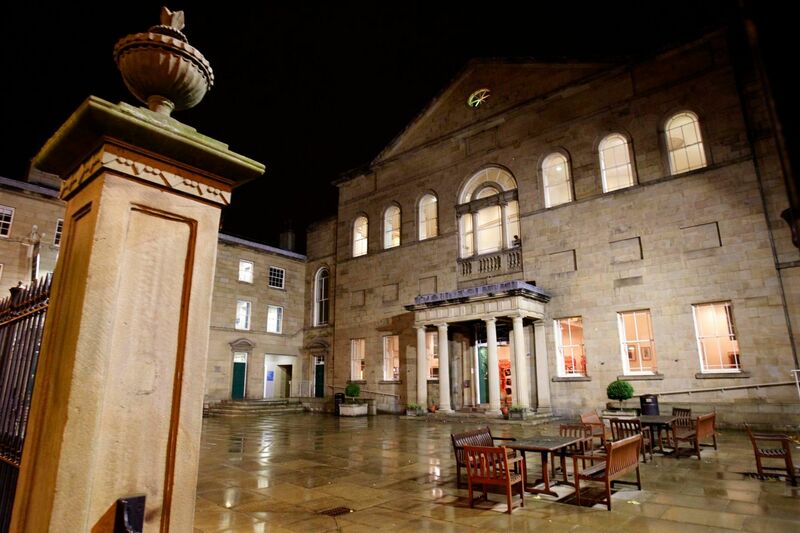 The organisers have picked a perfect venue. James Mason stared on from a plinth within. In the foyer there were stalls selling ukuleles. Lots of Ukuleles. 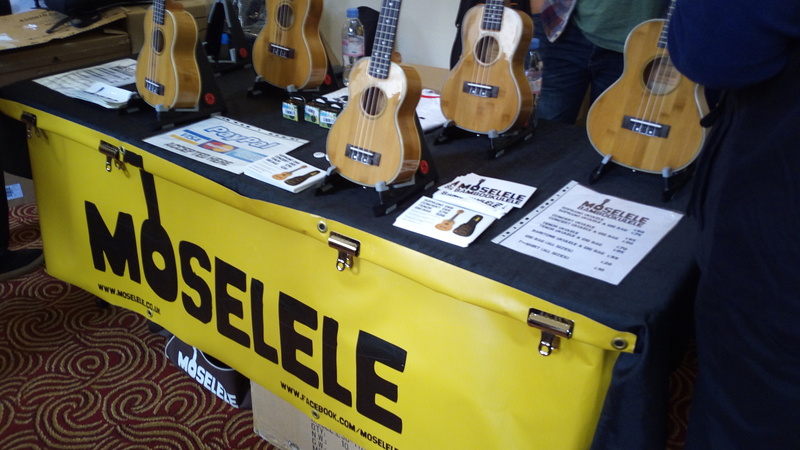 At the Moselele stand, I tried a Moselele (Bamboo) uke at £60 and thought it very nice. 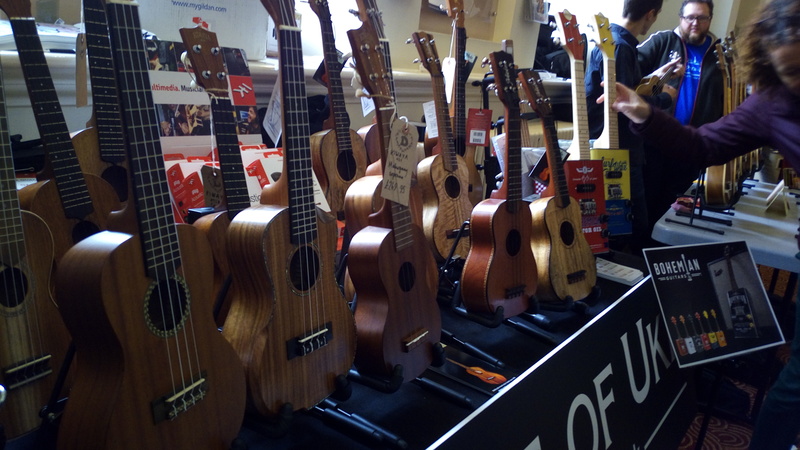 Duke of Uke were up from London with a massive stand of ukes ranging from £17 to £900. 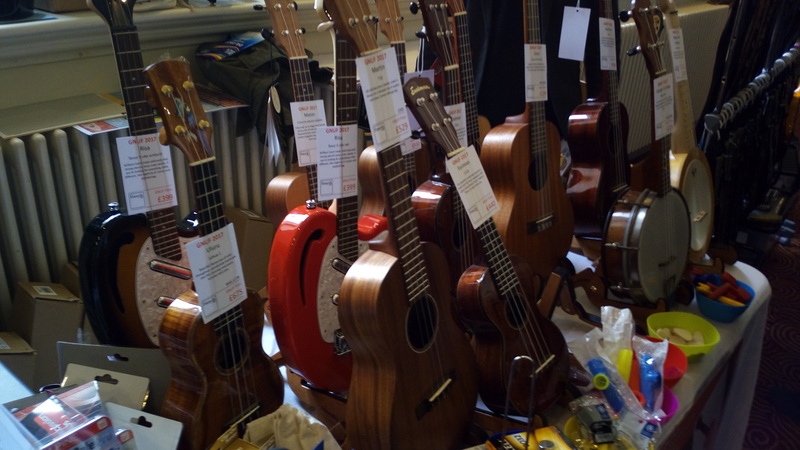 I was very VERY tempted into an oil can ukulele at £129, but thought of my wife burning my other 15 ukuleles to make space for the new one and decided to avoid. Other stalls sold hangers to put your beloved uke on a wall, straps to put your uke around your neck, t-shirts, badges, raffle tickets, stickers, gadgets and CDs of the artists playing. I bought a programme and started to read. First act I saw (as I said I turned up late and had to leave early – so tried to get as much in as possible. All the way from The Netherlands: We Tigers. She has the voice to die for and plays toy instruments as well as a glockenspiel. He’s a master of the uke. Next up was a chap who taught a workshop (GOD!! I MISSED ALL THE WORKSHOPS!!! Next year I will be more organised!!). PERCY COPLEY. He teaches finger picking and his performance puts us all to shame. He’s funny, warm man with a massive talent. I’m going to watch all of his videos on the youtubes! Hosted by the utterly wonderful Heidi Bang Tidy, the afternoon flew by. Moving drum kits off stage became a 10 minute audience participation session with Miss Bang Tidy. A brilliantly funny lady. I think I counted 3 or 4 costumer changes. A proper show woman! First up was The Poor Boys of Worcester. Six lads playing and at any one point there would be up to 4 ukuleles on the go. On chap strumming, one chap noodling, one chap doing a “guitar hero” solo, one playing a chisel. They were great. Really good fun. I’d love to see them in a pub. Quaintest Show on Earth. I loved these. Only one uke, but great musicians. Lads from Wigan with a great sense of humour and plenty of talent. Samantha Muir. This classically trained guitar player just has too much talent. It was almost like having a revelation. 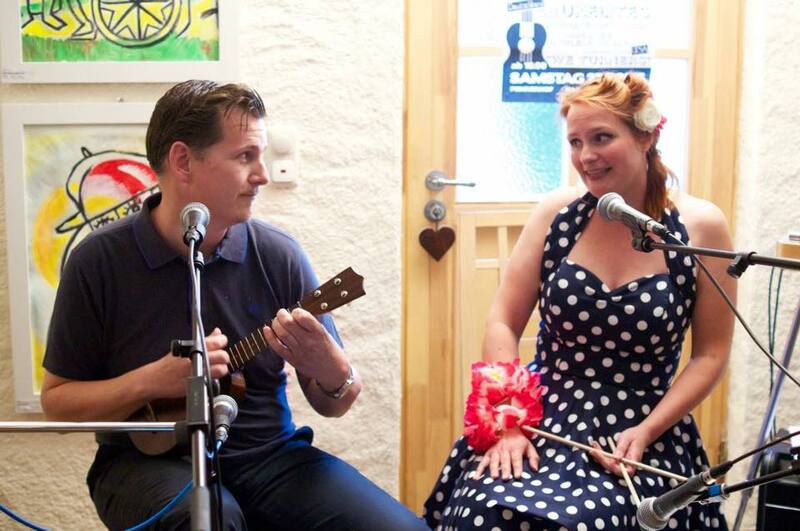 She played the predecessor to the ukulele – the Machete and another tiny Ukulele that I cannot remember the name of. Then moved on to a “normal ” ukulele. Seriously, people were sat with their eyes closed in a religious trance. She got a standing ovation and it was well deserved. She finished with a piece she’d written herself about the rain in all it’s forms and you could hear the patter of drizzle on a tent, a tropical downpour and all the variations in between. She can do anything from folk to jazz to classical. I’d personally like to see her do a heavy metal solo to be honest. Small Change Diaries. Ukes, great singers, mellow bass and drums. This is a professional group playing cool music. They write their own songs and were great. Spotlight: here players under 25 were given a chance to shine and it was blinding. I’m not sure if the artists here didn’t turn up as two players were listed here as Dani and Liam – but the lady who played accompanied Samantha Muir earlier of classical guitar. She was amazing as you might expect. She did a French A level on Friday and has her Spanish A level on Monday. Next: All the way from Australia. Another chap who is in the same vein as Jake Shimabukuro. Ryo Montgomery. Long haired and laid back, he was superb. He didn’t sing much, but he played like he’d made deal with the devil. Another standing ovation. He specialised in playing his own rhythm and melody at the same time. Beautiful. Finally – The act I had missed two years ago at Cornucopia: Biscuithead and the Biscuit Badgers. Brilliantly funny and talented. Approved by Prince Charles. . They had the audience laughing, singing and waving their arms with (what are classics in my household), “David Attenborough“, “I’ve go my Finger up my Nose” and “My Mysterious Uncle“. Superb lunacy. I only wished they’d had more time to play “Tweed Jacket” or “Soy Milk“. After over 4 hours sat in the main theatre, I went to stretch my legs and buy chips. With a “small one” in tow, (she’s taller than her mum), I decided she’d had enough and it was time to head off home. We’d had a great day and I was utterly impressed. I had only been for a small part of one day. There was a Friday night in various pubs for weekenders that seemed to be legend now. There was an evening in the main theatre that I was going to miss. There was a late night cabaret in the Cellar (over 18s only). There was a whole Sunday of workshops, 4 stages and a get together in the bar. I missed more than 75% of the weekend. It’s a massively inclusive festival that supports local people who in turn support the GNUF. The title of Best Ukulele Festival in the UK is well deserved. 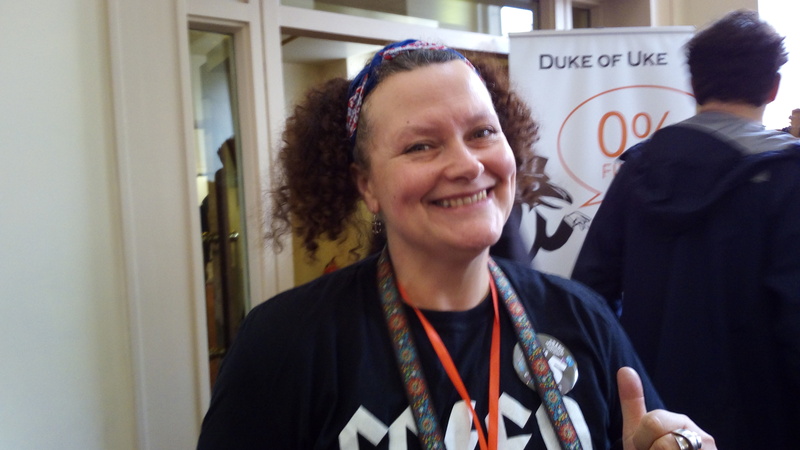 If you think of the best performer you have seen at a ukulele festival and then multiply that by 50 acts – you are close to the quality of GNUF.